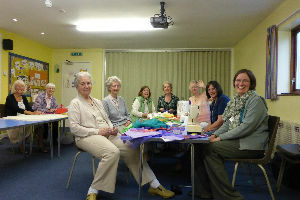 The banner group meets on the 2nd and 4th Wednesday mornings of the month, in the Parish Centre. We experience great joy and fellowship as we work together, stitching current projects and planning new banners. 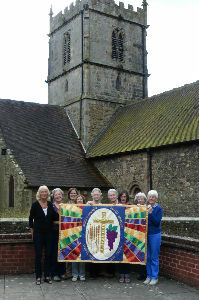 As well as making banners and other church textile hangings for St. Laurence’s, the banner group has been delighted to make pieces for other places of worship in Shropshire and beyond. The work for St. Laurence’s includes seven banners on the walls of the nave of the St. Laurence’s church depicting the ‘I AM’ sayings of our Lord Jesus. They are popular with both the congregation and visitors alike. The group’s largest banner is on the wall of the Parish Centre. 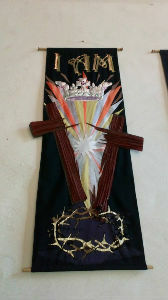 Its theme is based on Psalm 148, and shows many creatures in heaven and earth praising the Lord. 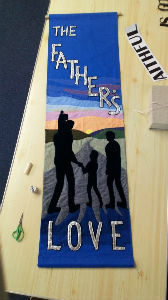 We have made banners to be carried on the Easter Walk of Witness, banners for local prisons, and for other churches in the area and further afield, including in 2016 an altar frontal for a church in Tanzania. 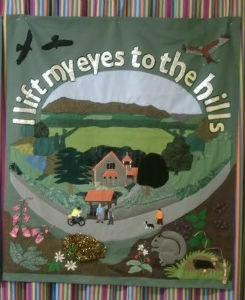 Recent projects include an ‘I will lift my eyes to the hills’ wall hanging for St. Michael’s and All Angels Church in All Stretton: banners for Longdon church, a church in Somerset, and a chapel, and an altar frontal for All Saints in Little Stretton.